"Mathematics is one of the essential emanations of the human spirit - a thing to be valued in and for itself - like art or poetry." 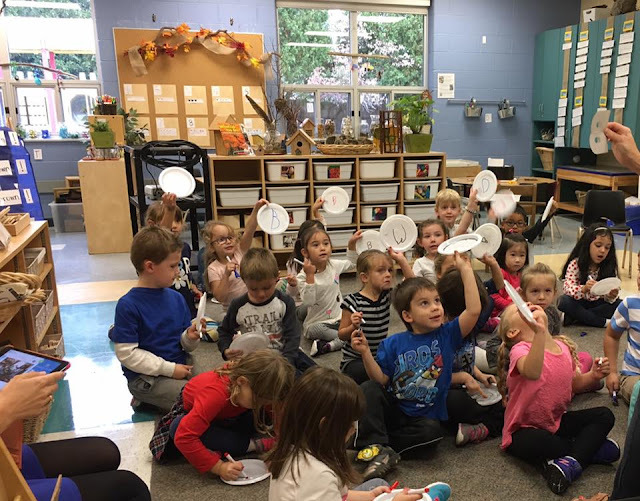 Math has become one of the most engaging and aesthetic experiences in our inquiry-based classroom. The more I experience math pedagogy in practice, the clearer it seems to me that math and the arts are intertwined. 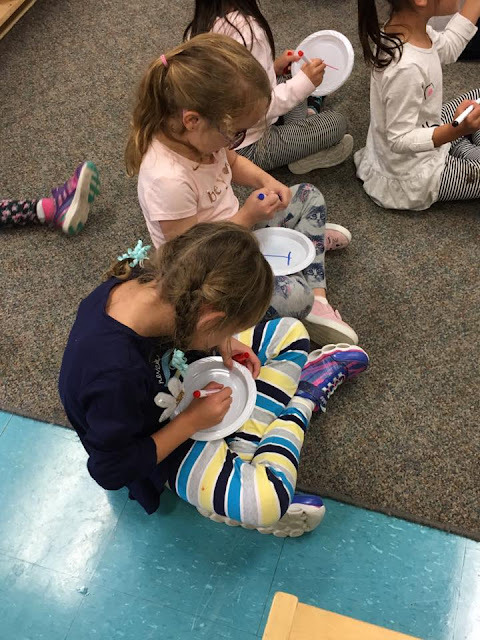 I have been inspired to look at all actions in our classroom through a mathematical lens, regardless of which learning domain they appear to belong. 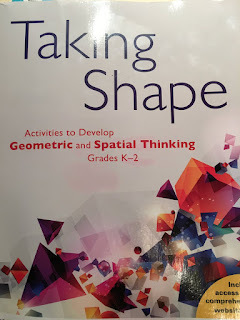 Many of our recent endeavors have been inspired by a wonderfully rich book I have been exploring regarding geometric and spatial thinking. 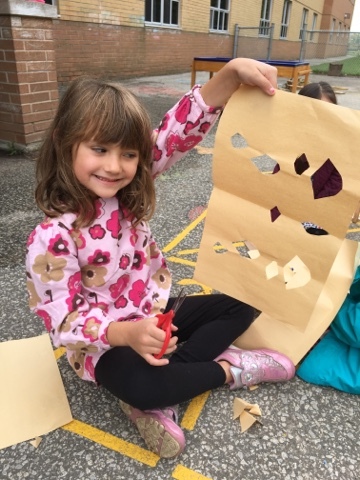 In Taking Shape the reader is taken on a journey of understanding regarding the importance of engaging young children in rich spatial reasoning activities and inspired to replicate and evolve many of the activities in the classroom. Many of these also celebrate aesthetics in shape and design, something the arts encourage as well. The authors advocate for the inclusion of more spatial reasoning in the classroom for many reasons: spatial reasoning and mathematical thinking are intimately linked, spatial reasoning can always be improved regardless of the age or experience level of the students, spatial thinking is an important predictor of achievement in STEM careers, spatial reasoning is currently an under served area of math instruction, and spatial reasoning provides multiple entry points and equitable access to mathematics. One section in particular, symmetry, stood out to me. Recently I had noticed symmetry appearing in many of the children's wooden structures made from large and small blocks. 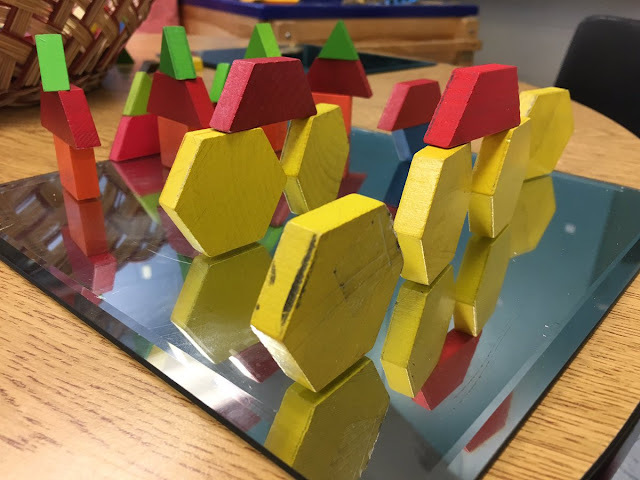 I wondered if they had previous experiences with symmetry and felt that it would be an excellent place to begin some intensive spatial reasoning work. 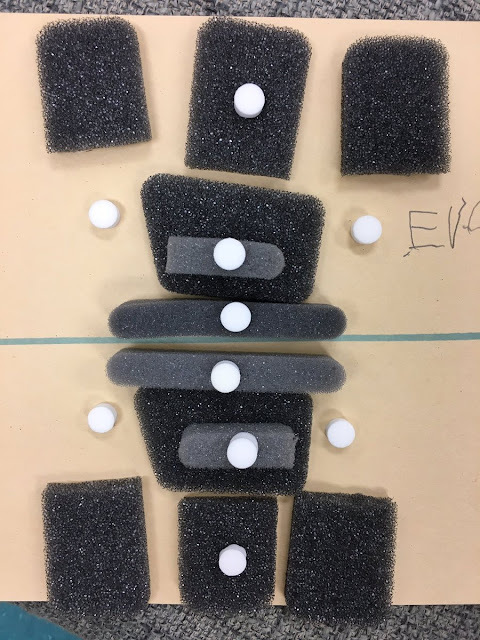 "In simple terms, two shapes are symmetrical if you can slide, flip, or turn one of them to have it match the other exactly...Symmetry provides an engaging context in which to explore mathematical structures and patterns. Symmetry - in particular, reflection symmetry - is a rich area of spatial reasoning that we can tap into as educators of young children. Symmetry is also important for later mathematics when making efficient mathematical arguments and working with graphs." I have collected 12 of our most engaging activities exploring symmetry and described them below in the hopes it will inspire you to continue to explore symmetry together with children in your classroom or home! For this experience we have added clear, sticky mack tack to an extra easel in the classroom. 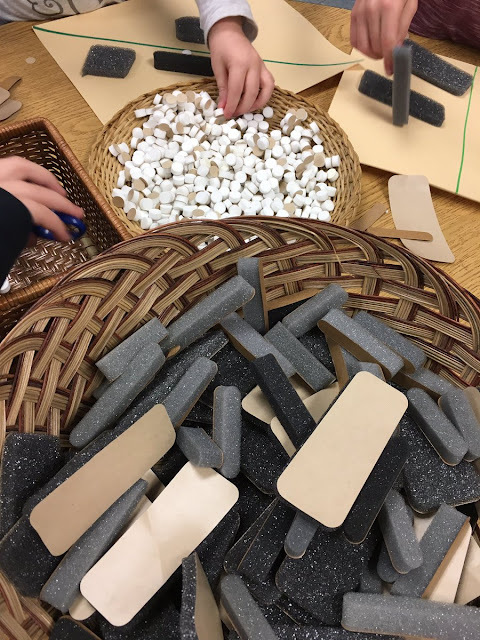 Engaging math manipulatives like wooden pattern blocks can be non-permanently affixed in different patterns and designs to the mack tack. A line of symmetry can be added to help guide children in their work. When finished, a child simply removes the pieces and the easel is ready for another. 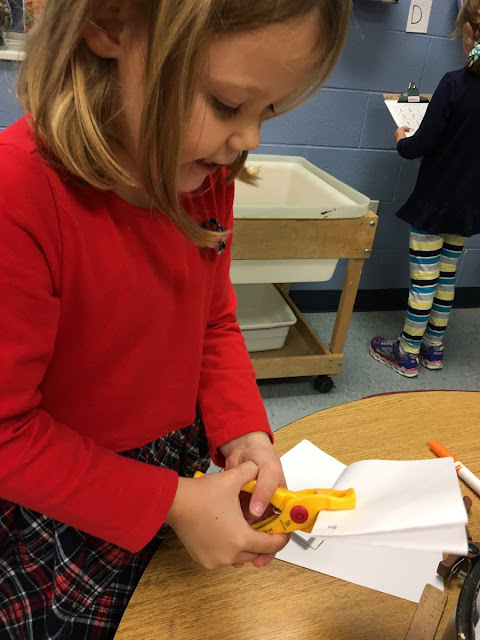 Hole punchers are excellent tools for encouraging fine motor work - they are difficult to squeeze and require patience and perseverance on the part of the user. A paper that is folded in different ways and has holes punched in various designs will open to reveal one, or many, lines of symmetry. Many classrooms have linking cubes or unifix cubes. 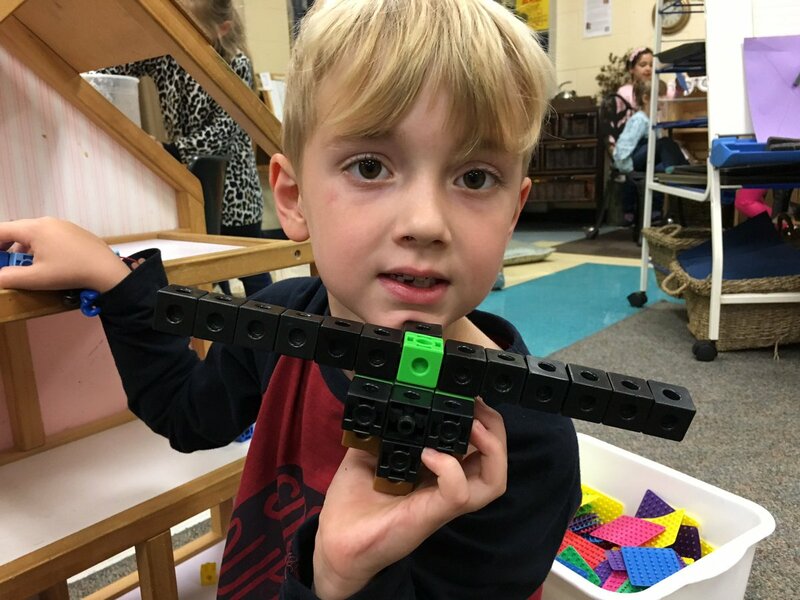 Our children have been drawn to using them to create small robots and airplanes. Because of their versatile nature, these cubes can be linked on all sides, and children can easily incorporate symmetrical design into their creations. 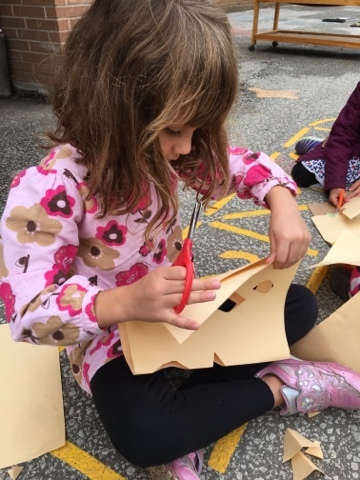 Loose parts offer endless opportunities for exploration of spatial reasoning and design. 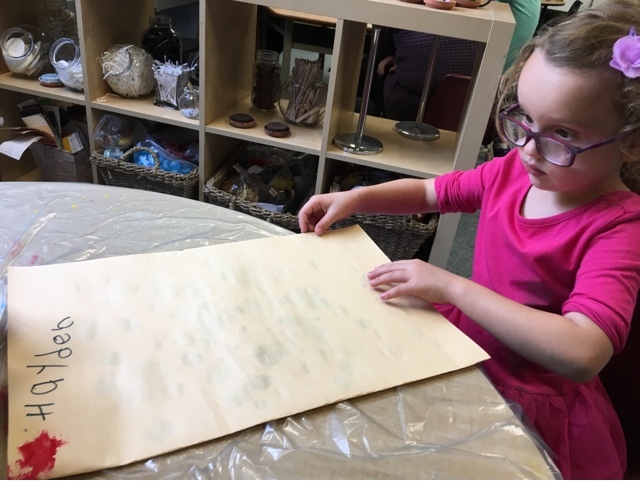 A recent trip to the Scrap Box in Ann Arbor, Michigan (a recycling centre for art materials) provided us with many foam pieces that had one sticky side. We drew various lines of symmetry on paper (horizontal, vertical, diagonal) and encouraged the children to place the foam pieces symmetrically on the paper. It was interesting to see their designs being built in 2D across the paper, and in 3D upwards off the paper. 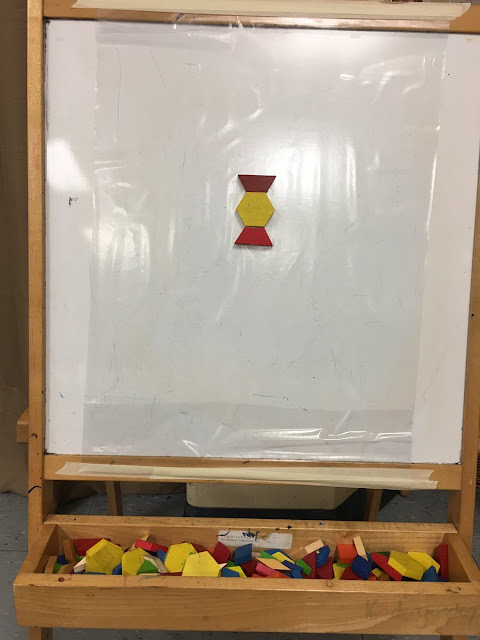 Recycled wooden game boards are excellent grids to use when encouraging children to consider spatial reasoning and symmetry in their design. The grid design helps children 'picture and place' geometric shapes symmetrically. 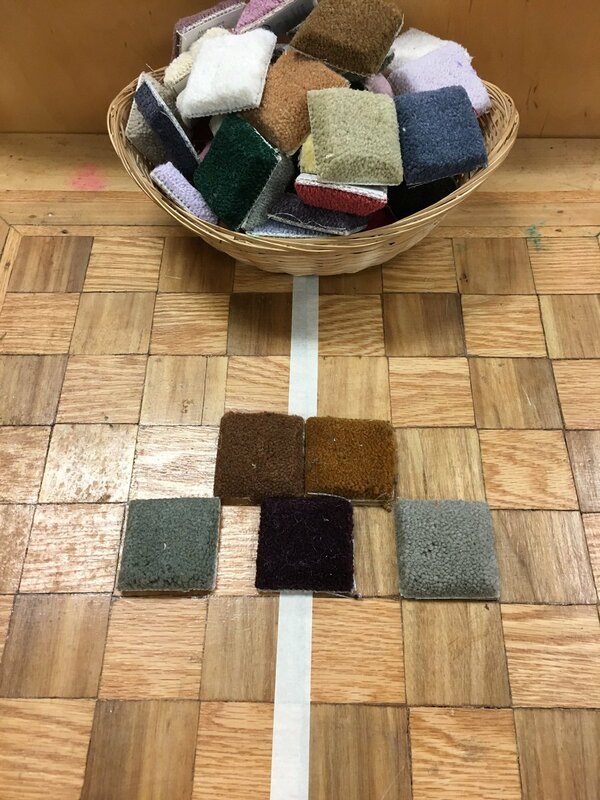 In this experience we've offered recycled carpet samples to entice children who enjoy tactile experiences into creating interesting mathematical designs. 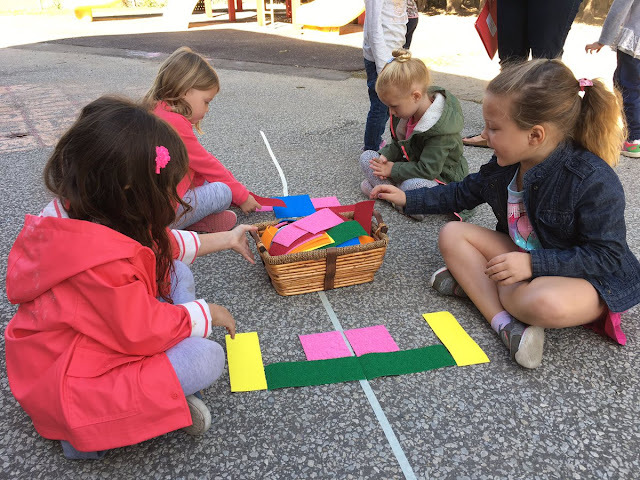 Taking math outdoors is always fun! 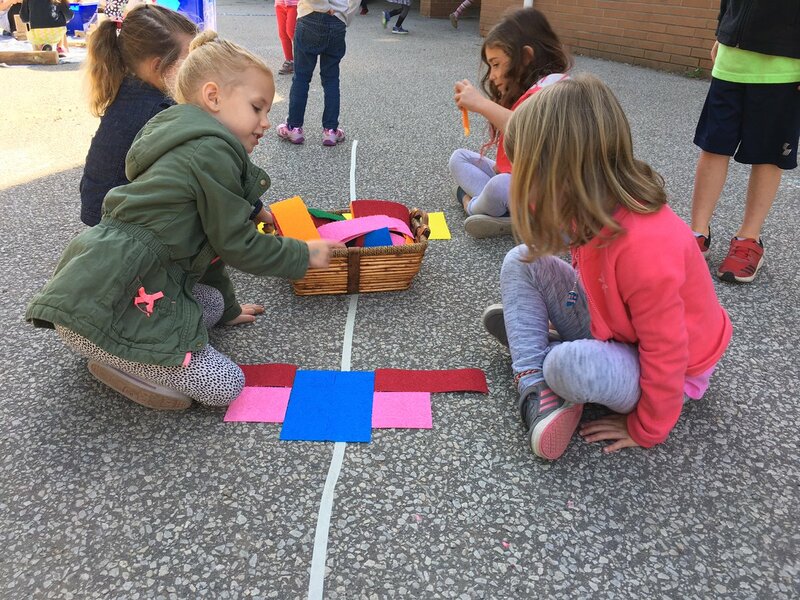 In this game, a line of symmetry is created with masking tape on the ground. Large foam shapes (easily cut from Dollar Store art foam) are used as game pieces. One child is the leader and the other the follower. The leader places a shape on his/her side and the follower has to create a symmetrical design by placing the same shape in reflection on the opposite side of the line. The result is an intricate symmetrical design. 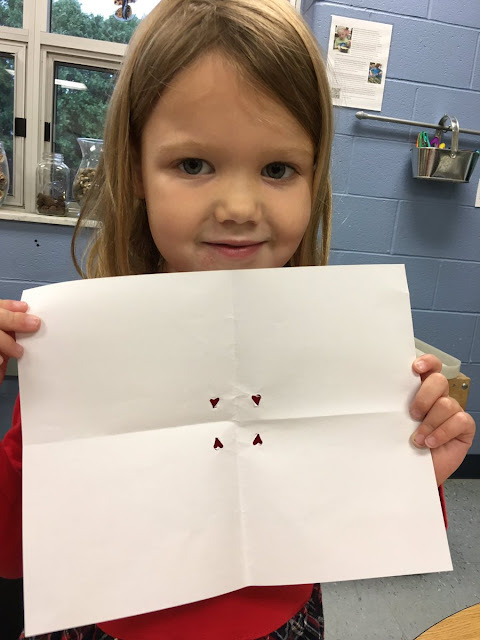 Similar to using hole punches, encouraging children to cut shapes onto folded paper results in the creation of interesting symmetrical designs. This is also a fun activity to bring outdoors. 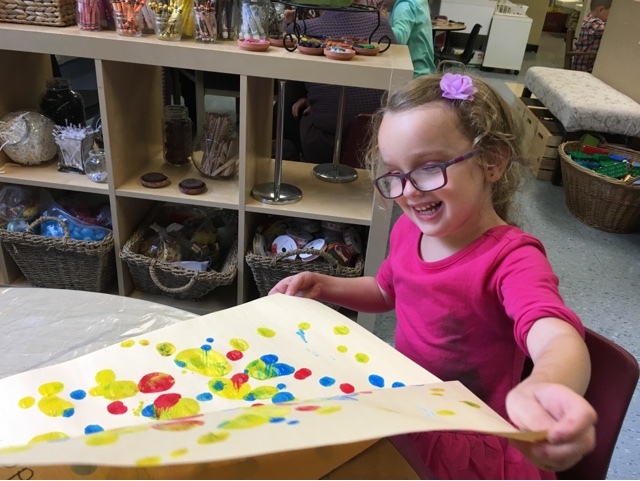 Children love to drop paint onto paper and fold it in half to create interesting colours and designs. 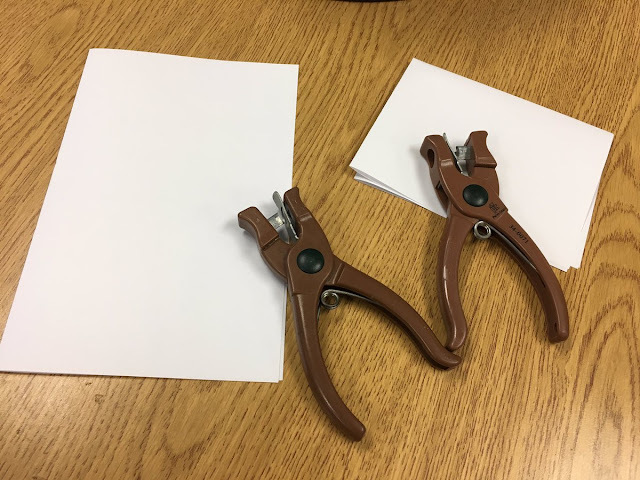 In this activity the paper is folded first, indicating the line of symmetry. 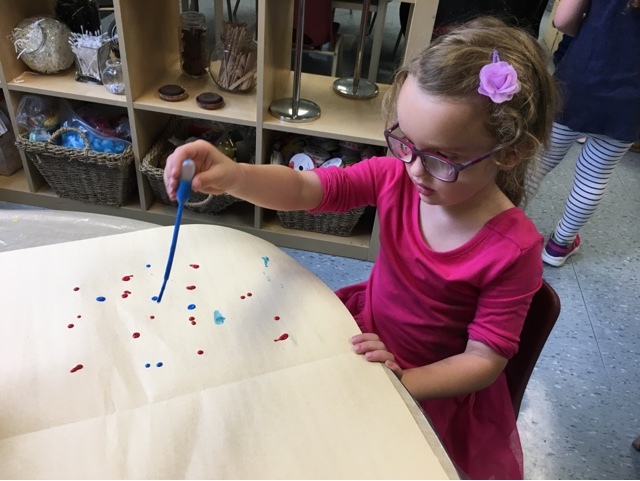 Children are encouraged to carefully use droppers/pipettes to drip paint onto one side of the paper only. ...and is opened to reveal a symmetrical picture! When the primary colours of paint are used the creation of secondary colours is an added bonus! Helping children find symmetry in the world around them is an important discovery to instill the idea that math is everywhere. 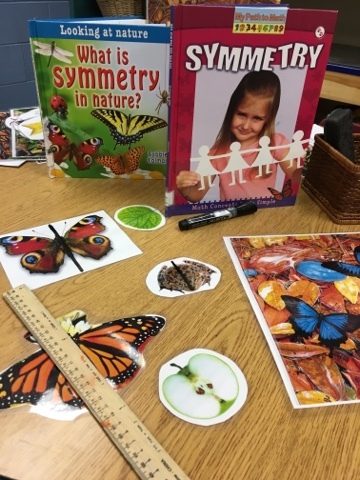 We offered books about symmetry for the children to explore, along with laminated photos of real objects from nature. 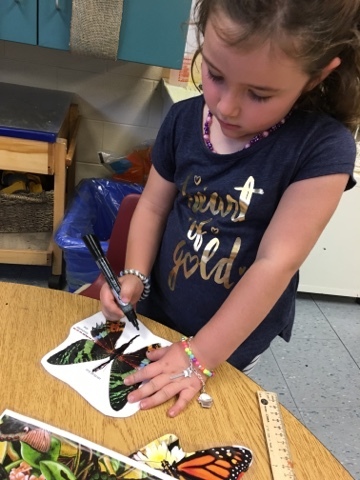 The children were encouraged to look at the different pictures and then use dry erase markers and rulers to draw the lines of symmetry they saw. Pentominoes are complex math manipulatives that fit together in interesting ways. 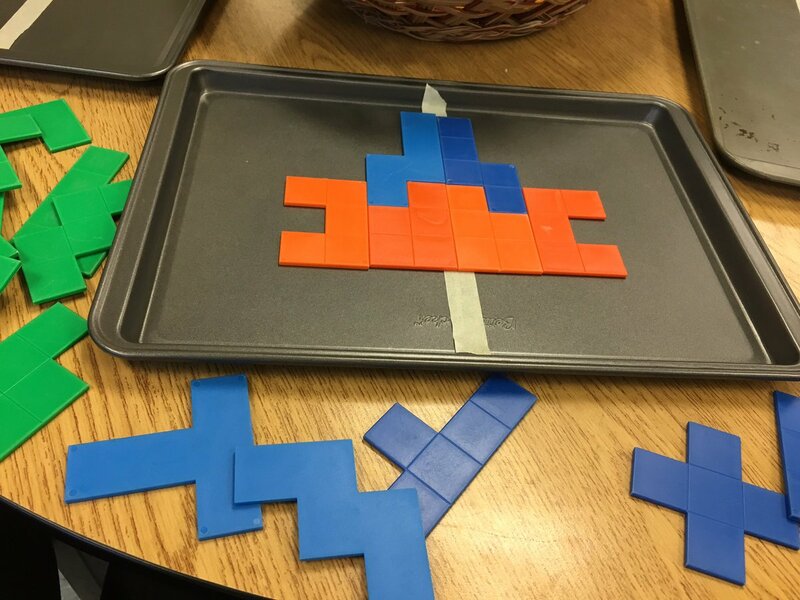 In order to challenge children we added a line of symmetry to a tray and encouraged the children to see if they could create a symmetrical design with the pentominoes, while trying to fill the tray at the same time! 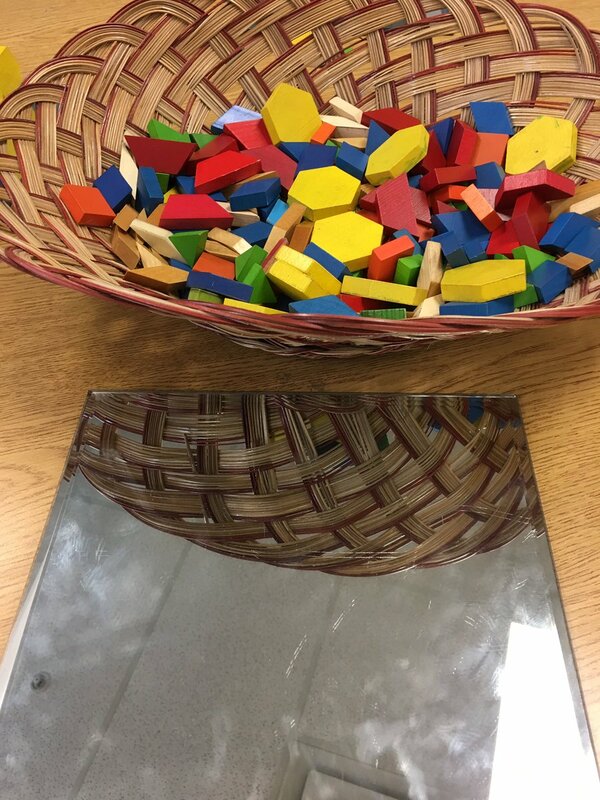 Building on mirrors is an interesting way for children to explore symmetry. Whatever is constructed on the mirror will naturally reflect symmetrically with the mirror as the line of symmetry. Children are often amazed to see their creations reflected, which sometimes results in an interesting discussion of 'doubling' in addition to symmetry. Many letters are symmetrical in nature (e.g., A, B, C, D, E, H, I, M, O). 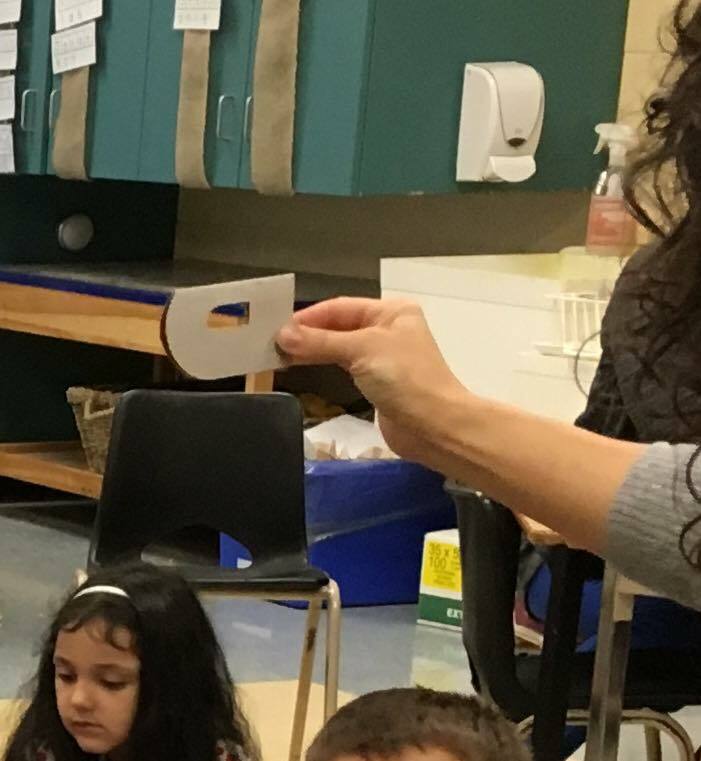 In this game children are shown a letter that is folded in half and asked to guess what the letter might be. ..and then look to see the letter revealed! The line of symmetry is evident as the fold line on the letter. We will continue to explore symmetry this upcoming week! Stay tuned for more ideas! Feel free to add comments and additional ideas for exploring symmetry in the comments below! Love Taking Shape, especially the symmetry activities. Thanks for the mirror idea - I have never seen that one done before.